Did you ever attend a Chassidic wedding and feel like an outsider because you didn't know the steps or even what the names of the dances were? Now AMK Productions and Chony Milecki Music have provided a video reference guide so you can impress your friends with your newly acquired knowledge. Maybe you'll feel like such an expert after watching the video a few times that you'll even be willing to try a few steps. 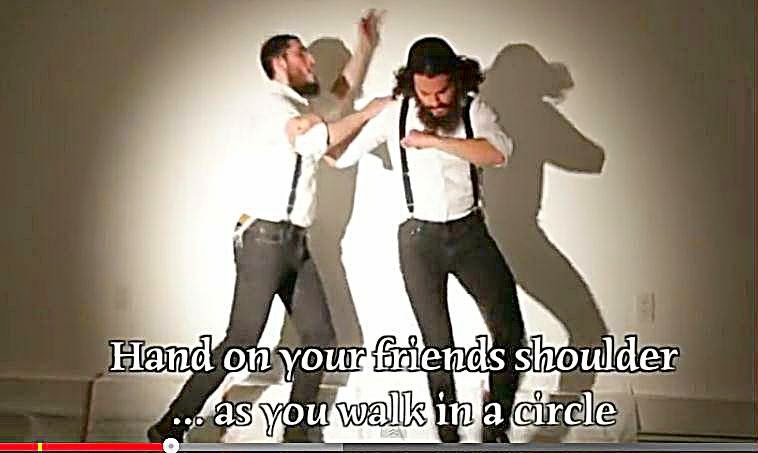 The video includes such favorites as Od Yishama, Hup Cossack, Choson on the Table, The Chassidic Running Man, Penguin Dance, Mitzvah Tantz , Na Nach Nachman Style, and that perennial favorite, Hand on Your Friend's Shoulder as You Walk in a Circle. And all that before the main course is served. Oy, are we tired. So much energy. I wanted to dance with them. Wonderful.